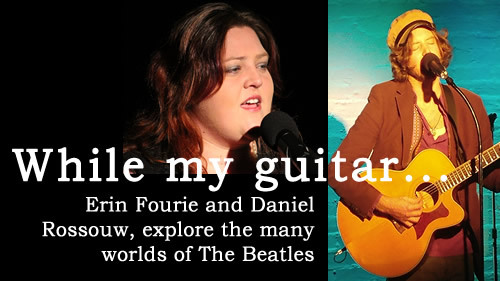 Erin Fourie and Daniel Rossouw, along with Peter Mitchell form the Hexagon Theatre in Pietermaritzburg who devised and directed the show, took a different route in compiling the music for their Beatles tribute show, While My Guitar, which was seen at the Hilton Arts Festival this year. Instead of just presenting a compilation of “The Best of the Beatles” they, have delved a little deeper and have created a show which features some of the lesser-known Beatle music, along with a few of the biggies. They have also looked at factors which influenced the Beatles music while making their selection. I am not convinced by the description of “lesser known” when applied to Beatles music and in fact most the songs performed are classics in their own right, and were instantly recognisable. Fourie and Rossouw, accompanied by their guitars, put their own interpretation to the music but never strayed too far from the original. As a result, the show had a fresh and current feel while remaining quintessentially Beatles. Erin Fourie, who some time ago was a finalist in that TV horror show, Idols, has a gorgeous voice. It is powerful, with beautiful tone, character and range. She certainly did great justice to the songs she performed. It’s a wonder that we have not seen her in any of Durban’s many tribute shows as she certainly has the versatility of voice to do well in any of them. Unfortunately, it is not the same for Daniel Rossouw, He has a nice voice with a pleasant timbre, but he struggled with pitch on several occasions. However, he made up for this with a dazzling display on his acoustic guitar. 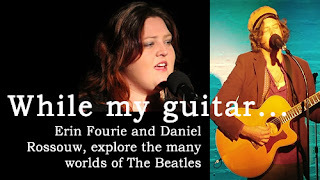 Fourie and Rossouw also provide interesting snippets of information about the Beatles while engaging in friendly banter with each other. This was at times a little stilted and uncertain. It seems as if this is a new show and they are not quite used to their interplay yet. However, both have the charm and easy smiles to get this right and make it a fun part of their presentation. Songs that were heard during 75-minute show included While My Guitar Gently Weeps, Love Me Do, Golden Slumbers, And I Love Her, Here Comes the Sun, Girl, Honey Pie, Norwegian Wood, A Day In the Life, The Fool On the Hill, Eleanor Rigby, Baby Its You, Mr Moonlight, We Can Work It Out, Rocky Raccoon, Michelle and the obligatory Hey Jude. While My Guitar was a fabulous show, a nostalgic journey down a road of happy memories.